My grandfather, Stephen Norwood Carre was born on Fleming Rd, Cedar Cottage on December 26, 1910, then a suburban community outside of Vancouver proper. My grandfather, Stephen, was baptized by Reverend Thomas Green of Robson Memorial Methodist Church located at 1553 East 18th Avenue on Otocber 19, 1911. 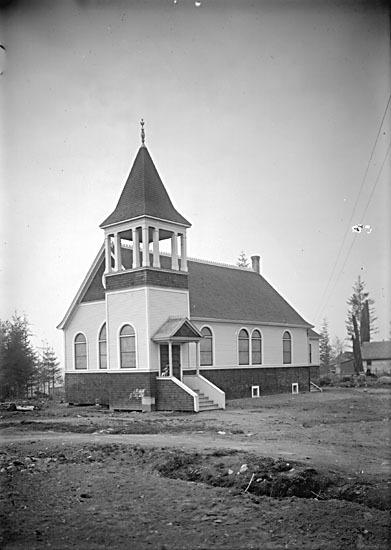 This church was built in 1907 but burned down in 1921. The site is now St. Mark's Lutheran Church. This picture of Robson Memorial Methodist Church located on Fleming Rd and Flett Rd (East 18th Avenue) was taken in 1908. The centre of Cedar Cottage village then was a block of stores and businesses on Commercial Street between 18th and 20th Avenue (3500-3600 block), and from this centre the rest of the area was a solid residential district noted for large families. This village grew directly from the interurban line that was built in 1891 to link Vancouver with New Westminster. The Cedar Cottage stop, also known as "Epworth" was located just south of the present Croatian Community Centre. The original cabin, a cottage built among a grove of cedar trees, existed as early as 1886. It is in this context that my greatgrandparents, Annie (ne: Jones) and Edward Carre came to live in Cedar Cottage. Annie, a young widower with small children, purchased property at 3317 Fleming Street on her own in 1906. She had met my greatgrandfather in Kamloops, BC and married him in Seattle, WA. Annie had previously been married to Joseph Evans and had travelled from Wales to BC in the late 1890s. He died of consumption in 1905 in Kamloops. The house my greatgrandparents came to live in was then an area of wilderness. The land was once owned by Harry A. Jones in 1893 and then sold to George Turner who in turn sold one of the parcels to my great grandmother, widow Annie Evans for $600. The purchase was witnessed by Harry A. Jones. It is not clear at this time whether Harry A. Jones and my greatgrandmother, Annie Jones, were related. Around this time, the Robson Memorial Methodist Church was being built, a church that my gretgrandparents would have attended. My grandfather was baptized in this church. The church is named for Reverend Ebenezer Robson, who ministered in New Wesminster as early as 1863. The United Church of Canada was formed in 1925 with a merger of the Presbyterian and Methodist churches. Certainly, the early settlers of this area were of British and Welsh descent. 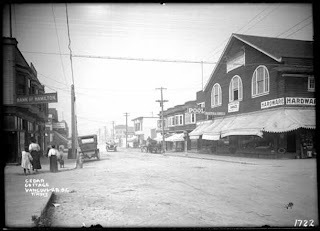 For example, Joseph Jones, a Welshman, became an important member of the community and mentioned in the 1909 "Times" of South Vancouver. Another early settler was Patrick Jones. His was property is now a park, Jones Park, on Victoria and 39th. "The first thing most early residents remember [about Cedar Cottage] is bush, trails, small creeks and few neighbours. Some were fortunate to live on a road that had been opened up; others had to pack fuel, food and other necessities through trails and in the bush. There were few people in the area around 1906 or 1907 and most streets boasted no more than two or three houses." This photo was taken in 1909 and shows in the top right hand corner houses at 3401 and 3473 Fleming Street which would have been very near my greatgrandparents house. By 1910, Cedar Cottage had developed into a small but independent village with a post office, 40 stores and a two-storey school had sprung up as this photo attests. However, as the automobile became more popular during the 1910s and 20s, Kingsway became a major thoroughfare drawing businesses south, away from the village centre. The 1911 census shows my Annie, 42 and Edward Carre, 39, my grandfather, Stephen, 5/12 and his sister Helen Mabel, 4, living in Cedar Cottage. 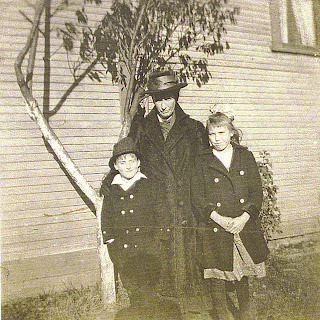 Here is a photo of my greatgrandfather, Stephen (around 7), his sister, Helen (around 10) and my greatgrandmother, Annie, likely at their property on Flening Rd in Cedar Cottage around 1917. Aunt Maggie, who lived with Edward and Annie, her grandparents until she was about 12, believes the photo was taken near the dining room window, perhaps behind the tree; she used to get into trouble for jumping out of that window by hanging off the ledge. Clark Park was called Buffalo Park by all the people around there. To my Aunt Maggie, and her sister, Beverly, Annie and Edward were like extended parents as their mom, Helen, worked. She says it was such a lovely time for kids as she had such freedom. She says: "As long as we were home by dinner we could go where we like and do what we wanted. There was a gulley nearby where we used to dig tunnels and make forts and have huge battles. Horses and carriages brought the milk and the bread. A rickety truck brought the ice and when the carrier went down the long path at the side of the house my friends and I would jump in the back and take big jagged hunks of ice and run!" "When they were at 3317 Flemming Street (not Rd) he built the first house where later a small garage stood half way down the property which was at least 3/4 acre or more. My Aunt Helen and grandfather Steven were born in that first house. While Edward built the second larger house closer to the front. It was built in the centre of the front of two legal lots, which was why it had to come down when it was sold . The house to the north is still there as are several houses on the street. Aunt Maggie has talked to several of the neighbours who were quite interested in the history of the street." "Edward used to tell her about the salmon streams loaded with fish nearby when they first moved there. They had a cow and chickens and Aunt Helen was thrown off the cow one day when she was young." "The church summer bazaar was always held in their garden as it was a large property with fruit trees, a large lawn to the south and a rose garden. There was a pitch and putt on that side made with sunken soup cans. My great uncles would carry the trestle tables down the street." My dad, Alec, has memories of the large closets in their place. That's where you had to go when you got punished. He also remembers the big fruit trees out back that he would used to climb. Early European settlers were in East Vancouver were largely Irish, British, Scottish and Welsh. Today, evidence of these early settlers from Britain and Ireland are found in places such as Cambrian Hall (built 1929) for the first Welsh Society in Vancouver (est. 1908). 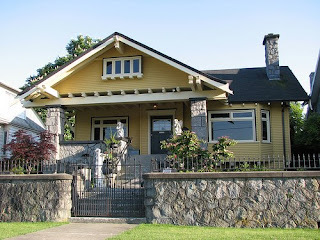 This legacy is also evident in East Vancouver today, such as through the Wise Hall (Welsh-Irish-Scottish-English). By the beginning of World War I, Cedar Cottage was no longer rural. Small wooden and stucco houses lined the streets. Workers spent ten hours a day in the factories, either riding the tram to the mills that lined False Creek or walking to one of Cedar Cottage's growing industries: Nanaimo Foundry, Fletcher's Meats, to name a few. During WWI, my great grandfather, Edward and his brother George enlisted for miltary service and was part of the Home Guard. Edward worked as an Engineer for the Vancouver School Board. Edward and Annie lived in Cedar Cottage the remainder of their life. When Edward became no longer able to care for himself in the 1950s, he stayed at a small private hospital, resting home down the block called Hillside Hospital at 1606 East 15th Avenue. The building still remains there today overlooking Clark Park, the second oldest park in the City after Stanley Park. The building, built in 1907, is considered a grand classical California-style Craftsman bungalow. In 1956, my greatgrandmother died in that area, the funeral service was held at the Mount Pleasant Chapel located at 1595 East 18th Avenue where Dr. Evan Baker was officiating. In a letter I received from the Archivist, BC Conference, United Church of Canada: "Baker clearly knew her [Annie] as he returned to do it [the funeral service] 4 years after he reired in poor health." My grandfather also died in that year. "When Annie died in September in the nursing home (picutured), Aunt Maggie says Edward was so broken hearted, he died in Dec. He had been placed there but would disappear and be found in their empty house, only to be taken back. My grandfather, Steven took him back to Edmonton after Annie's death but he was too unsettled and unhappy to stay. My Aunt Maggie was still going there every week and I could see he was unable to look after himself. He could not be contained in the nursing home and could not cope without Nana. It was so sad." Edward also worked as an Engineer at St. Paul's Hospital and the Provincial School for the Deaf and Blind. He was a member of the Canadian Legion, Mount Pleasant Branch.